We cast off with no specifics: rent a car, choose places (Rome, Venice, Florence, Orvieto), book hotels because it’s high tourist season. And with these as our compass points, we set off to explore. Travel causes me equal amounts of excitement and anxiety. The excitement comes first: I get the itch, book the tickets (impulsively, always), and remain excited until it’s time to leave for the airport, at which point the anxiety sets in. Transitions aren’t the easiest: lately my internal dialogue takes on a reassuring tone and coos ‘it’s just change’ as if I were a child having a tantrum. And then there is the arrival. The disassociation: Where am I? Who am I? What year is it? The basic ‘I exist’ mantras that we have about ourselves that we don’t even notice most of the time drop away and I feel utter panic. Am I just a pair of eyes floating through space? A wisp of a soul, a spectre? Without context, do I exist at all? That’s when I start looking at plants, repeating their names to myself like a mantra: Magnolia for relief. Poplar, joy. Alianthus, irritation (have they invaded everywhere?). Dock, fondness. A field full of sunflowers with their heads all facing the same direction, awe. Then they start coming faster as the car zips along: apple, olive, peach, plum. Passiflora, poke, pine, pine, pine. Each name ekes out a little space for me in the ground, like a root digging its way into the earth establishing its own existence. By the time we get to the hotel, I have context again: my name is Rebecca and I am in Rome. This is the magnolia tree outside our hotel door; that is the pine at the park up the street. I have a place and it is, for right now, here. We took to walking in the early mornings before it got too hot. In the Aventine, as the sky started changing, we looked out over the Tiber, lazily chugging its way towards the sea. The forum, 2000 years old and hanging out there in the middle of the city like it’s not the seat of Western civilization or anything. The Victor Emmanuel monument behind it: a truly hideous wedding cake-like structure built on top of Roman ruins. Surrounded by orange trees in a park, a couple push their bikes in, holding hands, and start necking in the corner. We make our way back to the hotel for breakfast, then jump on the train to Ostia Antica. 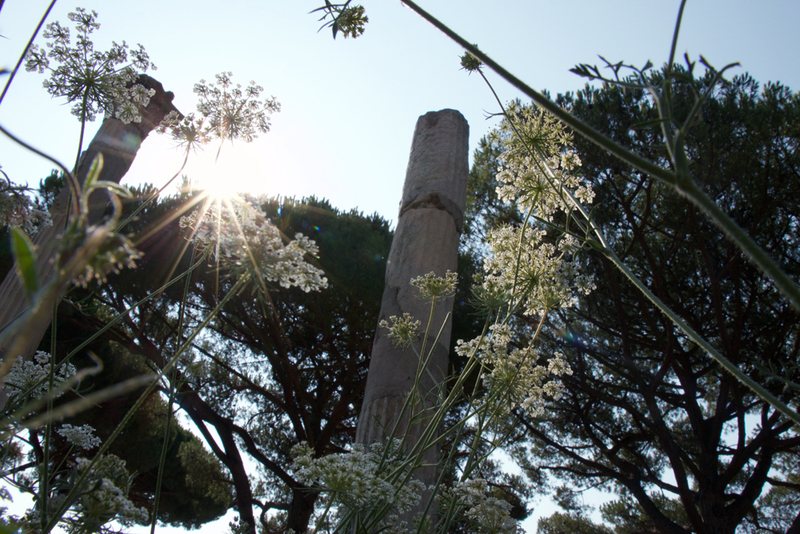 If you are in Rome, please go to Ostia Antica. It’s an entire town, 2000 years old, laid out for you to explore. A 40 minute train ride, and there are almost no people there. We had the place to ourselves for two hours in the [almost] cool morning. We climbed the ampitheatre, and from there my attention was pulled towards a spot nearby. ‘Is that a temple?’ I murmured as I wandered towards it. Marble columns at the top of worn marble steps. A flat grassy area covered in queen anne’s lace and pennyroyal. I swear I could hear chanting, smell copal, see priestesses with their heads covered. 'My people were here', I say to nobody in particular. 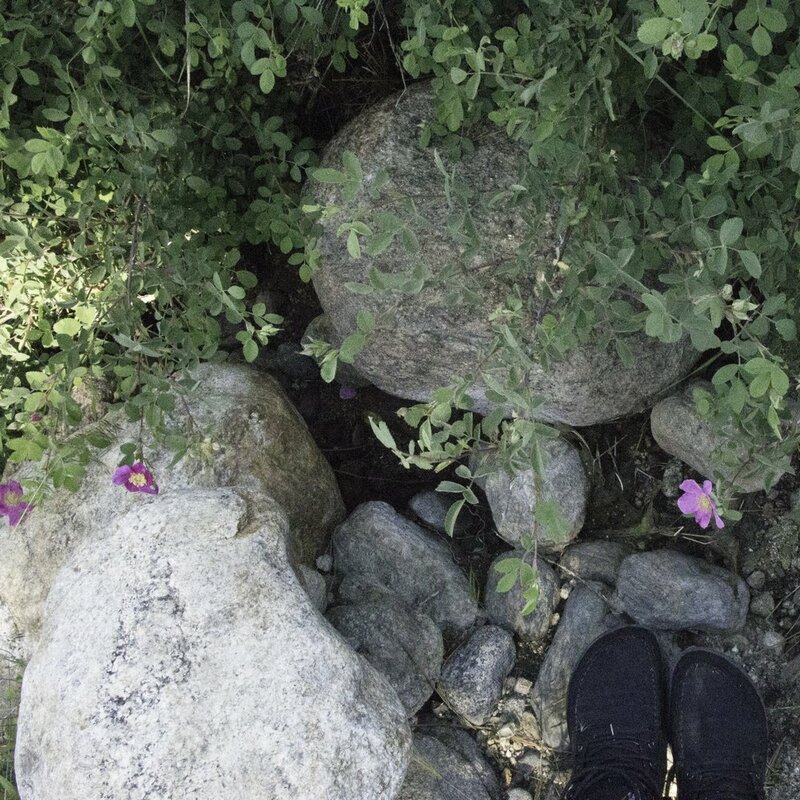 What that means I don’t know, but I sit anyway, listening to the chanting, ancient, as the sun comes up through the pine trees and a lone ant crawls across my leg. I nap there until the sun hits my face, then I get up and go to find Jam, who has the map in his hand. It was a temple for Ceres, it turns out: goddess of the harvest. We did the same in Venice, no longer jet-lagged but enjoying the feeling of being up while the city still sleeps. 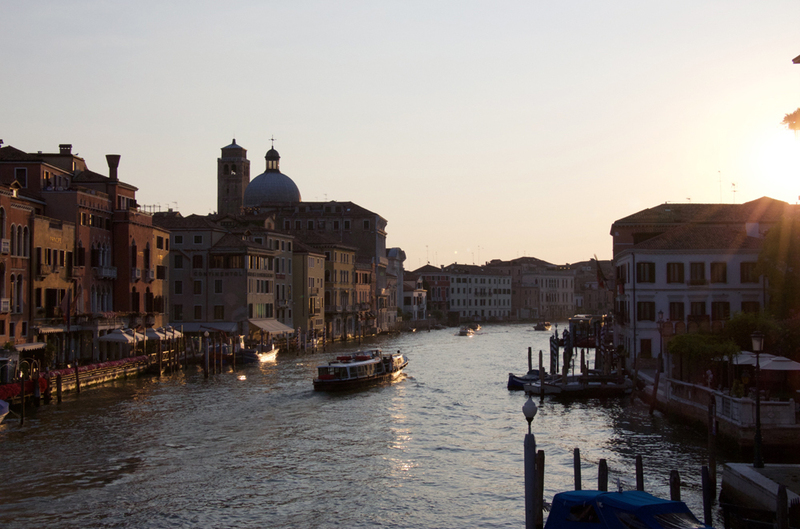 Taking off in different directions, Jam jogged towards Rialto bridge while I walked north towards the edge of the main island, and looked out over the lagoon while the sun rose. The cemetary island in the distance, walled off and inviting (I love cemeteries). a lone boat makes its way out into the lagoon. The water is calm, lapping the wooden posts holding pontoon that I stand on. I stay until the pink fades from the sky then walk aimlessly. 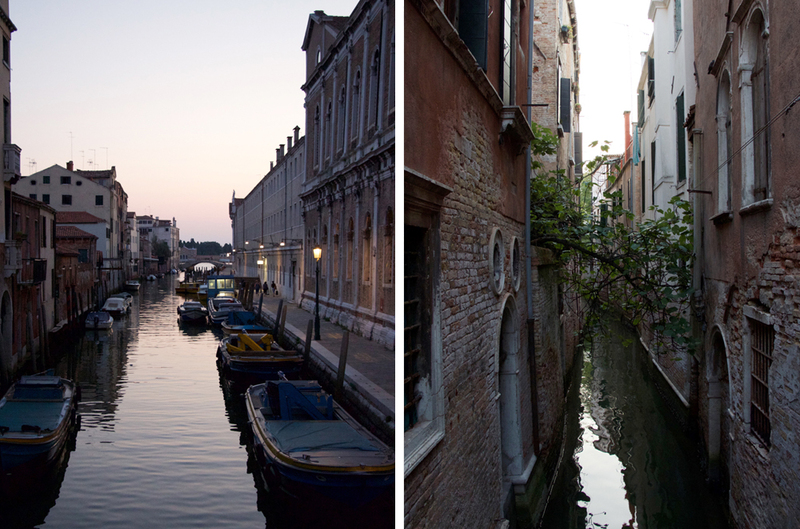 Of all the places to get lost in the world, Venice is the most fun. We run into each other on the way back to our hotel and stop for a quick cappuccino. There is a little old lady standing in front of the open door like a cat trying to decide whether to go in or not. I walk around her, she tells me off, hands gesturing, Italian too quick to understand. Jam points and laughs until he, too is shouted at by an old man who informs him that this isn't the beach (he's in workout clothes still). We have the best meal of our lives in Florence. It’s a tiny 4-table restaurant on a small street, run by a husband and wife who source all their ingredients locally. Wild Tuscan boar, fresh truffles, this exquisite sherry vinegar, a sparkling white sangiovese wine that I’m still thinking about. 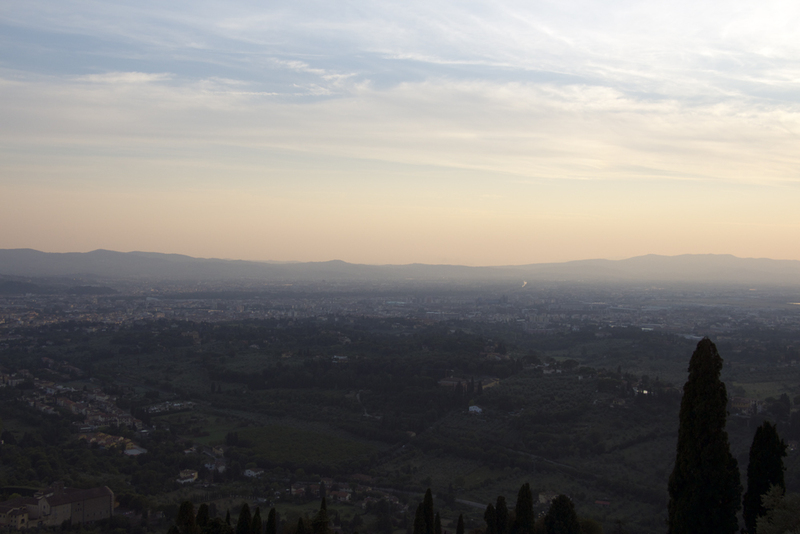 We wake up at 5am again, and walk to Ponte Vecchio, head up into the hills, to try and catch a view of Florence as the sun comes up. The walls are too high so we eat figs and blackberries that grow over the walls instead. Walking back we stop at a little forno and eat pastries and drink cappuccinos from the cafe next door. A couple of old ladies walk in, one points at my pastry and starts smiling and talking in rapid-fire Italian. I have no idea what she's saying but I smile and nod anyway. Orvieto and Umbria. After ten days of cities and buildings we were surrounded by fruit trees and countryside. We took walks through the woods, ate wild blackberries, plucked ripe figs off trees, ate wild plums until our tummies hurt, lounged around by the swimming pool that looked out over the old city of Orvieto. This was my favourite part of the holiday, to be honest, the long lazy walks and the exploring the countryside. We found a hawthorn grove carpeted with prunella. We found hot springs deep in a canyon, canopied with ripe fig trees. We ate pigeon risotto and wild boar, and ripe fruit and sat in hammocks reading. It was an absolute dream, especially for my overworked self, and by the time we had to leave, I was back to anxiety again.